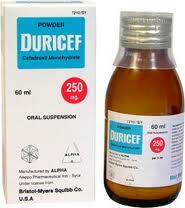 An asthma prophylactic and anti-allergic agent. – Slow release oral tablets (Allerban S.R) 2 mg/tab. treatment. Allerban does not abort established attacks of asthma. therefore, the daily variation of plasma concentration is lower with the Allerban S.R tablets than with the normal form. The relative bioavailability of the Allerban S.R tablets is more or less similar to the bioavailability of the normal form. – Prophylactic treatment of bronchial asthma. – Prophylactic and symptomatic treatment of allergic conditions including allergic skin reactions, rhinitis and conjunctivitis. is up to 4 mg a day in two divided doses. From 6 months to 3 years: 2.5 ml syrup twice daily. 3 years and above: similar to the adult doses. exacerbate asthmatic attacks. To avoid this, it is important to oontinue the existing treatment for a minimum of 2 weeks after starting Allerban therapy. This particularly applies to those patients who were taking systemic corticosteroids and ACTH. During the first few days of treatment with Allerban, the normal reflexes may be impaired. Patients should be warned not to take change of vehicles or machinery until the effect of Allerban treatment is clearly manifested. In rare cases, patients who are receiving oral anti -diabetics may be susceptible to a reversible fall in the thrombocyte count if they use ketotifen concomitantly. Therefore, thrombocyte count should be carried out for those patients. spontaneously after few days. Weight gain may occasionally occur. Allerban may potentiate the effect of sedatives, hypnotics, antihistaminics and alcohol. 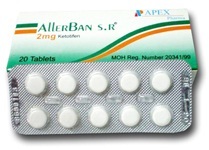 Allerban tablets S. R 2mg : pack of 20 tablets. Allerban syrup 1 mg I 5 ml : bottle of 100ml. Pharma S.A.E· Badr city. Cairo Egypt.